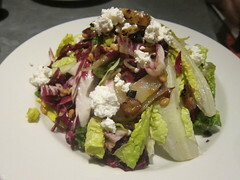 The Roasted Pear Salad is an autumn delight, utilizing Bosc pears, dates, ricotta cheese, pine nuts and fig & olive vinaigrette over mixed greens. If Pitfire excels at anything, it’s the combination of flavors from its ingredients and this seasonal salad embodies that as much as anything. It was probably almost three years ago when I first realized the potential of Brussels sprouts, and if my memory serves me correctly, it might have even been Pitfire that was the place. 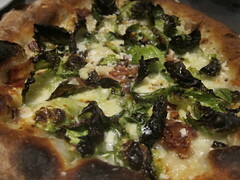 I was reminded of this as I tried their Brussels Sprouts and Bacon pizza – the Brussels of which were as much of a texture study as the bacon was there for flavor. Cream, garlic and fresh Parmesan round out the pie, and it’s an easy prediction that this pizza will be an easy fall favorite. 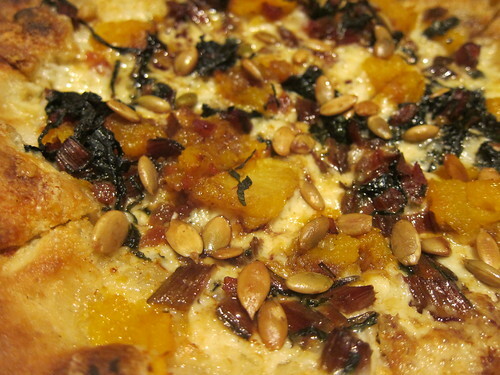 Or maybe that would be the Roast Pumpkin Pizza, or more accurately a sage-roasted Kabocha squash pizza. I love that they used fontina cheese on this one, a cheese that puts the pizza under the savory column. Because if it’s anything that bugs me about the liberal use of pumpkin in all the seasonal menus across town this time of year, it’s the predictability that that item would be sweet. And while the pastas are solid, my favorite meat that they’re serving right now has to be the fennel sausage, which you’ll find in their fall pasta. At the media tasting, we got a substitute of sorts thanks to ingredient availability but also Jason Neroni being the chef for the night. It was a Rye Rigatoni pasta with crispy bacon, Brussels, taleggio cheese, rincotto and brown butter. Pretty much heavenly, but I must disclose that it’s a menu item that is still in the works, so thankfully you can look for it in the near future. Until then, you’ll have the 15th Anniversary “Tuscan” Pizza, which Pitfire is putting on special for $7.95 per pie, the price at which pizzas were sold in 2006. It’s a rich, savory pizza, thanks to rosemary-roasted potatoes, gorgonzola, onions, mozzarella and pesto. Worth a try, if you’re up for something new. Either way, you’re always in for a treat when you visit Pitfire. Grab a glass of Southern California beer, like The Bruery’s Autumn Maple, Golden Road’s Gettin’ Offa That Brown Ale or Alesmith’s Nautical Nut Brown Ale. If you’re feeling more like apple cider shandy, cranberry lemonade shandy or one of their sangrias, you can wash your meal down with one of those instead. Then again, you may want to show up for one of the upcoming $2 beer pour nights: Black Market Brewery beers are just that – $2 – on November 14th (Fairfax location) and 15th (DTLA). Alesmith beers are also $2 each on January 16th (Fairfax) and 17th (DTLA). Whichever fall flavors you crave, I’ll see you at Pitfire. This entry was posted in beer, Culver City, Downtown LA, Fairfax, North Hollywood, wine and tagged @pitfirepizza, Culver City, Downtown LA, DTLA, Fairfax, Jason Neroni, locations, North Hollywood, Pitfire Pizza, pizza, West Hollywood. Bookmark the permalink.